Family Business? Are you crazy? Who’d do that to their children? Family and Business should never go together. They’re not naturally compatible systems. But if you are going to do it, and families have done it since history began, you’d better get it right. A great family business is unstoppable. A bad one puts the family at risk of losing everything. Our family business services, based on years of experience, help you to get it right the first time, or help to make things right after they’ve gone wrong. Make no mistake, none of the great, long-lasting family businesses rely on luck! The primary goal of most business families is to have a happy family and a strong business, both on a long-term, sustainable basis. Achieving this means getting a lot of things right: (a) for the individuals; (b) for the family; (c) for the business and (d) for all of them, taken together. …….. and meanwhile you have to keep the business going! Our advisory services are designed to produce these outcomes, with every piece of advice and action directed towards solving problems in ways that work for all stakeholders, in the family and in the business. Our primary goal is to be an exceptionally effective trusted adviser to families in business. To this end we’ve researched, developed, tried and tested a comprehensive suite of services and resources, designed specifically for family business use. They’re described briefly below, with further information available via links. When your family is out of whack – with each other, with your business, and/or with the world at large – nothing seems to go well: either in business or private life. Everything you do seems to make things worse, and eventually you stop trying. If you value your family (and your sanity), it’s time to try a different approach. Rational problems can usually be resolved through rational thinking and rational actions. If all else fails, rational threats may work! When nothing can be made to work in the family in a family business context you can bet it’s because the issues are more emotional than rational – which means they won’t respond well, or at all, to normally rational strategies. To get things running smoothly the family needs to be “aligned”. This means getting everyone on the same page, and happy about: “The Plan”. The Plan describes: where the family is going; what it’s doing; why it’s doing it; who’s doing what; how they’re doing it; when they’re doing it – and, more than anything else: the point of it all for each individual, for the family as a group, and for the business. By the time we’ve worked it all out, every member of the family should have clarity and certainty and a commitment to The Plan. This journey has many facets and objectives, including: education, communication, trust building, team building, negotiation, relationship repair and sometimes some fairly direct therapy. Whatever …, as the family gets aligned, everything becomes better. Suddenly anything is possible – even the stuff that looked so hopeless before the process started. By now you’ve probably worked out that Family Alignment usually comes at the front end of our process. Many successful families create a legacy to pass on to their progeny and future generations. In his excellent book: “Family Wealth – Keeping it in the Family” J.E. Hughes defines family wealth in terms of: Human, Intellectual and Financial Assets. This places a strong emphasis on the human capital side of the equation. Over many surveys, established business families consistently confirm that their priority is for their children and grandchildren to be good people rather than wealthy ones, although helping to make them both is their actual aim. To work on the family’s legacy is to work on family alignment. The process leads to family stewardship (see following). Now we’re talking brain + heart food! Stewardship = responsibility for looking after and managing something well. Stewardship of the family’s legacy requires current family leaders to nurture what they’ve created and/or received from their forebears so they have something better to pass on to their next generations. This legacy includes the human, intellectual and financial capital (assets) we’ve already talked about and therefore represents the totality of what the family has learnt, built and accumulated over time. This requires a level of benevolence that’s quite different to ownership, since stewards are holding assets for others, whereas owners can do whatever they like with the stuff they own. When a family commits to Stewardship it’s chasing a form of immortality: potentially, if future generations get it right, the family can go on forever – ascribing its origins either to the family’s original entrepreneur (wealth generator) or to the generation that makes the original stewardship commitment. We need to explain the differences between various types of adviser. This has nothing to do with their technical competence, and everything to do with their respective suitability. Accredited Family Business Advisers have been trained to take a balanced approach towards helping business families achieve their goals – in both the family and the business. They use the 3 Circle Model of Family Business, which identifies and works with 3 systems: Ownership + Business + Family. This suits a rational, structured, commercial, legalistic approach that starts with business issues and considers individuals through their legal, moral and commercial rights. Our 3 Elements Approach replaces “Ownership” with “Individuals” in that model to become: Individuals + Business + Family. This reflects a more human and facilitative approach that starts by focussing on personal and family factors, issues and needs before moving on to address business and commercial issues. Accredited Advisers have qualifications, experience and good standing in one or more mainstream professional disciplines, to which they’ve added further training, knowledge of, and experience in, family business issues and best practice. Family Business Australia (FBA) is the peak body in Australia for Family Businesses. It also provides adviser training and accreditation, based on 4 days of workshops. Family Business Institute (FBI) is the leading organisation for professional family business advisers in Australia and New Zealand. It offers more comprehensive and advanced training, practice support and a rigorous accreditation process, based on Solutionist philosophy. TSG’s Jon Kenfield established FBI, with the support of a small and dedicated faculty, to elevate adviser training and accreditation to world class standards. This is us. It’s what we do. It’s the basis of FBI accreditation. To basic adviser training we added the power and wisdom of Solutionism, a much stronger focus on human issues (using professional psychs and associated experts as required), and a genuinely collaborative advisory philosophy that makes regular use of a network of trusted advisers. We believe this delivers the most effective and advanced family business advisory services available, anywhere. Advisers to Family Business are traditional professional advisers (lawyers, accountants and other professionals) with a special interest in family business. Although not accredited, some have a lot of family business experience and are highly effective service providers. Lack of accreditation means you can’t rely on their having a full breadth of knowledge about family business and business family issues. They’re also not subject to any accrediting body’s quality control, technical support or disciplinary procedures. Technical Advisers are archetypal boffins who don’t care who they advise, because they deal with technical, rather than human issues. They’re good at dealing with exotic and complex problems – assuming you have another adviser at hand to interpret your instructions to them, and their responses back to you! Technical advisers play a key role in our collaborative advisory network when we need someone with deep subject matter expertise to advise or act on a specific technical issue. Lead Advisers scope, co-ordinate, project manage and service parts of larger and more complex assignments. They provide a broad range of family business advisory services, especially at the commencement of an assignment, and bring other trustworthy specialists in, as a project progresses, to work together collaboratively to satisfy the family’s specific needs. The following chart is not exhaustive, but should give an idea of how this works. It’s all about providing you with the right solutions. 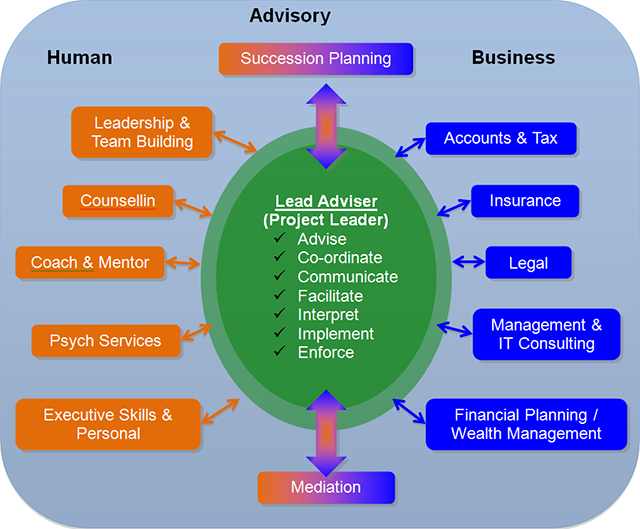 We often act as Lead Advisers, Mediators and Facilitators (especially in Strategy and Succession Planning).